Friends of smart shoe care will love our shoe cleaning kits. Instead of losing track of the confusing range of care products out there, simply reach for one of our comprehensive shoe cleaning kits. Each offers everything you will need to maintain your favourite footwear. Includes 6 different brushes from Solitaire. Includes 9 different care products from Burgol. 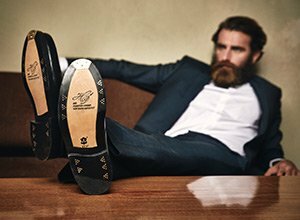 Perfect for business travellers: a 5-piece shoe care set for when you are on the go. Includes 11 necessities in a wooden box for simple, professional shoe care. Our shoe cleaning kits are the right choice for all friends of smart shoe care. Avoid losing track of all the shoe care products on the market with a one-stop solution: a hand-chosen shoe cleaning kit. Whether it is a shoe brush kit or a shoe care kit with creams, brushes and polishing cloth, our shoe cleaning kits combine all the care products you will need for a great shoe care. For professional care you need the highest quality products. Starting with different dirt brushes, an applicator brush, polishing cloth and creams right through to a polishing brush and an impregnation product. That is the perfect shoe cleaning kit – and the sign of a genuine lover. With a neatly assembled choice of care products, cleaning your shoes becomes far easier and more effective. Let’s not forget, it can also be fun, too! We offer a variety of shoe cleaning kits for every shoe owner’s needs. Two of our sets are all-brush kits, which boast all-important brushes for perfect care. 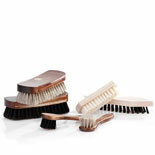 The nine-piece shoe cleaning kit with Burgol brushes leaves nothing to be desired. The brushes are hand-stitched with high-quality animal bristles and remove the grime and dirt from your footwear, spread shoe cream evenly over the leather upper and reach even the tricky parts of your footwear. Finally, you will get an astonishing shine with a specialised polishing brush. The six-piece shoe cleaning kit is smaller and the perfect choice for beginners. The quality of this shoe cleaning kit, whilst not comparable with our Burgol brushes, offers a perfect introduction to sophisticated shoe care. Polishing-, applicator-, dirt- and suede brushes are all included. Our large shoe cleaning kits are for those men, who would like to get all important care products together. You can choose between shoe cleaning kits with products from Shoeboys or Burgol. Starting with a dirt brush, shoe creams, impregnation products right through to special shoe cleaners and polishing brushes, you will find everything for a complete and flamboyant shoe care. A shoe cleaning kit is not only a convenient way to get all necessary care items together. It is also cheaper than buying each product separately.